As moms, we have so much on our plates. It's hard most days for me to either remember the things I need to do or to have the energy to do them. While I've gotten way better at figuring out a routine for myself, some days I really am just a hot mess mom. "But I just can't get organized! Life is so chaotic that there's no way I can rein it all in!" I hear you, mama. I have felt like that so many times. Like you, I struggle and am by no means perfect in the realm of productivity and organization. 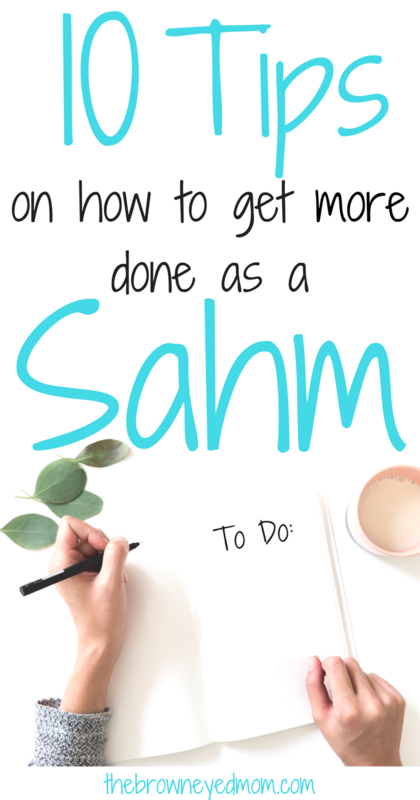 But, I have found there's 10 things that keep me grounded and more productive as a SAHM. I tend to need to remind myself to do them, but when I do, I feel like a million bucks. Because mama got stuff done! This is a major one for me! I can get really unorganized really quickly if I let myself. Whether you use a planner (like my favorite, the Happy Planner) or a Bullet Journal, like I've switched to, you need something to organize your days, thoughts, events and future plans. While I love planners and was quite the planner addict for years, I love bullet journaling for the simple fact I can make my journal work for me the way I want it to. While I use a dotted Leuchtturm1917, any journal works. You don't even have to set it up like a normal planner. Now, there are sooo many pretty bullet journal pictures on Instagram. I don't mean to shout at you, but DO NOT LOOK AT ALL THE PRETTY JOURNALS! In my experience, if you aren't artsy, don't want to really be artsy, and just want a way to organize yourself, please don't compare your minimalist, list-like bullet journal to these beautiful works of art. You will get discouraged and give up. Now that you have a planner or bullet journal, start making lists! A to-do list is a must. Whether you put it in your planner/journal, a post it, or a piece of paper on the refrigerator, make a list. It doesn't have to be anything complicated. But if you are someone who loses things, you need to put that list in one place. That's why I like my bullet journal or planner. I can make my to-do list and leave it open on the kitchen counter with a pen next to it. I do a task, I mark it off. Done. If you're currently not organized, I suggest you make yourself to-do lists every day. It seems tedious and monotonous at first, but if you keep at it, you will thank yourself in the end. I know there are those of you out there that go shopping with no list. Stop it. Unless you have a photographic memory and can remember everything that's in your fridge/pantry and what you're putting in your basket simultaneously, do not attempt a no list shopping trip. Not only does this waste your time because you cannot remember what you have versus what you need, you end up buying needless things that you already have. It's a vicious cycle where you can't remember if you have mustard and end up with 4 bottles of it in your pantry. Make your meal plan and list accordingly before even thinking ofleaving the house. I know there are times you are rushing out the door and the list gets left behind. I seem to do that every month or 2 myself. But in general, try and keep your shopping trip planned so that way you don't buy more/less than you need. Now, not all of your kids may nap at this point. Or you have a newborn and naps are inconsistent. But hear me out. Whatever your schedule is, you have to utilize naptimes/quietime. During my youngest's 2 hour nap in the afternoon, I have instilled quiet time for the oldest. He can play with quiet toys in the den, read physical books or books on his Amazon tablet, or rest on the couch. Anything he picks, though, has to be quiet and he has to be able to do it on his own with little to no help from mommy. I then, get to work. I usually start by tidying up the kitchen, dining and living rooms. Wash any dishes, sweep the floors, etc. This is also the time I either start a load of laundry or switch them from the washer to the dryer. I like to set a timer of 30 minutes to do these tasks. When the timer goes off, I finish up whatever I am doing and move on to a 30 minute workout. Mommy is *still* trying to lose the last "baby's" weight and this is my time to do this without much interruption. After the workout, I get water and a healthy snack, see if the oldest needs anything else to do, and then sit down to work on any blogging related tasks, make appointments or phone calls, etc. If I don't have much that is pressing, I may lay down on the couch for a minute in the den while the oldest does his activities or read a little before the youngest wakes up. Whatever your season of motherhood, try your best to make the most of nap/quiet time. Even if that just means taking a power nap while your newborn naps. Some of you are early risers and like getting up hours before your kids. Others of you can't imagine going to bed at 9pm and would rather stay up late and then wake up when your kids wake up. I tend to stay up late and get up when my kids get up, although I have been trying to shift to waking up earlier. While I do tend to be more productive during the day if I get up about an hour before the kids do, I tend to not be tired enough to fall asleep at 10pm to wake up at 6am. Either way, figure out what works best for you. As stay at home moms, we do need that hour or 2 without the constant needs of the children to catch up on things and even just relax. Notice I don't say schedule. Unless you are a person who thrives on precise consistency, schedules can be stifling and therefore make it harder to follow. A daily routine, on the other hand, sets the pace for your days with general flexibility. I like to block schedule (Check out Yolanda over at Put The Kettle On's post about time blocking. She has some really great tips to get you started!). Block scheduling allows me to create a routine for each day with the flexibility I need so I don't feel overwhelmed like with a schedule. When it's time for me to clean up, switch out laundry, wash dishes, etc, I like to give the kids an activity they can do without me for 15 minutes. I usually leave the box of colors and copy paper on their "school" table. They can sit down and color for a little bit while I do a few things. Honestly, if I leave the kids to play on their own without much direction, I get into what I need to do for about 2 minutes before someone stops me because they need something, want to play 20 questions about what I'm doing, etc. Busy boxes, coloring books, playdoh, etc are all good activities for the littles to do while you do a few quick things. I've even pulled Legos or the train set out and asked them to make something elaborate. Then, they focus on that and not what I'm doing! Do not jump from task to task! I've talked about "oh squirrel" moments in this post before. Essentially, don't start working on something, see something else that needs to be done and stop your original task. When you do this, you fall into a loop of starting and stopping tasks. Before you know it, while you've gotten a lot of things started, nothing is finished. There's nothing like working your tail off and then feeling like you've done absolutely nothing. It's a motivation killer and then your organization level will plummet. With time blocking, you can tell yourself that you are going to clean the bathroom during a 20 minute block. You can focus on the one task and get it done before moving on to the next thing. I am of the camp that my kids, once they can walk and sometimes before, can help clean up their messes. As a SAHM, I don't have the time or energy to constantly clean up behind my kids. And I want them to learn from an early age to be responsible for their possessions and messes. So if my 2 year old spills his water, he goes to the kitchen and brings back a hand towel to clean it up. When my almost 5 year old makes a mess in his room, he is responsible for cleaning it up. During the day, I have the kids do a quick clean up before transitioning to another room or activity. That way, things stay somewhat tidy and there isn't a mess that takes an hour or more in the evening to clean up. We tend to, as moms, get the mentality of "Oh, I'll just do it myself". While this may get the task done faster, you've now created more work for yourself and possibly given your children the mentality that "mom will do it". Which could lead to a downward spiral of you always doing everything and your kids wanting you to do it all for them. There's the old adage "You can't fill from an empty cup". This idea is absolutely essential to you staying productive and organized as a mom. If I'm not getting enough sleep, sun or exercise, I am a mess. I can't focus or stay on task for the life of me. For me, the hour or two after the kids go to bed are key. I can tidyup quickly then sit on the couch with my feet up on the coffee table. During this time, I can work on my laptop, read a book or watch tv. I make sure during the day (weather permitting) we get outside and get some sun and exercise for at least an hour. You can really tell if the weather has been nasty for a couple of days because everyone is grumpy. Whatever it is, find a way to take care of yourself as well. Find a new show to watch, leave the kids with dad and go to Target, catch a movie, something, every now and then. In the end, we only have so many hours in a day to get everything done that we need to get done as moms. Staying organized and efficient can greatly increase your productivity level and give you more time to do things you love instead of being weighed down with all you haven't gotten done yet. What kind of things keep you focused and organized? Sign up below to receive weekly newsletters and to get a free to-do list and meal planning printable!